The 60’s Band of the Week is back…and we are still on A. When you have compiled a list of over 1000 60’s bands and artists it may take around a lifetime to do each profile. Actually, at our new rate of one band a week I know exactly how long this list is going to take us at the Music Court. 19.2 years. If I stay at this current rate the list will be finished when I’m 40 years old. 60’s music will have moved into the realm of true “classics” and popular music will probably sound like a strange concoction of synthesized vocals and electronica. Okay, that list part was a little imagination on my part. How about we get to today’s 60’s band of note, The Ad Libs. Name: Originally a street-corner quintet named the Arabians and then the Creators, the band broke up in 1963 and re-formed a year later with new members and became the Ad Libs. Some of this was touched on in the brief name section above. The Ad Libs were Doo-Wop musicians that started on the streets in the mid 1950s. The story of The Ad Libs can be traced back to songwriter John Taylor, a saxophonist who had been playing with big band groups for several decades. He came across The Creators, the band’s second name (at the time), when they were in their nascent stage as a street-corner quintet. After The Creators hit no success with their releases, the band broke up and re-formed a year later as The Ad Libs with two former Creators, Hugh Harris and Danny Austin. Harris and Austin added Norman Donegan, Dave Watt and perhaps most importantly Mary Ann Thomas. John Taylor’s jazz and big-band music influence was an essential element of The Ad Lib’s brief success. He, with George Davis, wrote “The Boy From New York City,” which will forever be known as a true Doo-Wop one-hit wonder. The song’s mixture of Doo-Wop and big-band flavor makes it catchy and bubbly. Group manager Bill Downs took a tape of the Ad Libs performing the song to song-writing duo Jerry Leiber and Mike Stoller. Leiber and Stoller (along with George Goldner) owned Red Bird Records. After hearing the piece, they signed the Ad Libs to Blue Cat records (a subsidiary of Red Bird) and released the song in December of 1964. The song hit #8 on the Pop chart and #6 on the R&B chart at the height of its success. The Ad Libs would have to wait years before another chart appearance. 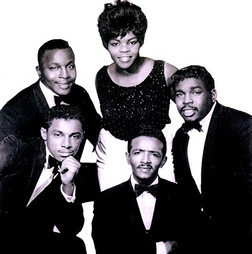 A few unsuccessful releases led to The Ad Libs being dropped from Blue Cat and bouncing around before signing with Share Records and recording “Giving it Up,” a Gladys Knight and Pips song written by Van McCoy. The 1968 release charted at #34 on the R&B list. Unfortunately, the band saw little more success as the years progressed. In 1988, The Ad Libs recorded four albums for John Taylor’s Johnny Boy Label. The band only consisted of two original members during the recording, Dave Watt and Mary Ann Thomas. Since then, Thomas, Harris and Watt have passed on. “The Boy From New York City” comes in with a rare zero dislikes on YouTube. Impressive feat for The Ad Libs’ best song.